You've taken digital pictures for years across multiple systems and camera upgrades, and now your collection is a mess. These free tools and techniques will fix your photos' metadata, weed out duplicates, reorganize folders, and otherwise whip your digital photos into shape. The aim here is to provide fixes for the common problems that plague photo collections, no matter what kind of photo organizer you're using, or what kind of data your digital camera provides. After this de-duping, meta-tagging, folder-fixing shape-up, you should be in a good place to keep your photos organized with whatever methods or tools you choose. Note: The main focus of this how-to guide will be on Windows systems, because, well, that's where a lot of photos are stored, and where the most help is likely needed. We have, however, offered Mac alternatives and suggestions in each section. Second, More Important Note: We strongly recommend you back up your photos—at least to an external drive, ideally to an off-site service like Mozy or Carbonite—before attempting to reorganize and fix your photos. That way you can be more confident in your moves to clean things up, while knowing that if you accidentally wipe out three years' worth of snapshots, they're still sitting on another drive. 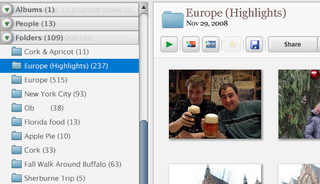 A folder full of vacation shots from 2009 that thinks it was taken on January 1, 2005? Very annoying. It happens because your photos have EXIF data, or "metadata," embedded in their guts with all kinds of information on how, where, and when the photo was taken. Cameras can mess this data up, as can photo applications. Whatever your problems, Microsoft's Pro Photo software is a surprisingly robust tool for fixing it. Drag a folder or groups of files onto it, select an individual photo (or all of them), and then start fixing what needs fixing. You can fix or add timestamps, location data, and much more. Mac: ShootShifter, a free download, has dual roles as both a powerful photo name organizer, as described above, but also a timestamp fixer and unifier. Select groups of photos in ShootShifter, set their timestamps, and that data is locked in for whatever photo program you're browsing with. There are two kinds of photo duplicates that clutter up the average hard drive. One is an actual file duplicate, an exact copy of an image file that might have a different file name (sometimes with a "(1)" or "-copy" at the tail end) but is otherwise the same package of data. The other is a photo duplicate—either two shots taken in the exact same spot, at nearly the exact same time, or the same shot resized in some way by photo software into two separate files. Duplicate files: If it's possible you've imported some photos more than once from a camera, or just moved around a lot of folders, run a duplicate file finder on your picture folders. 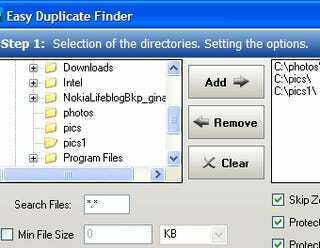 I like Fast Duplicate File Finder (FDFF) on Windows, because the free version is powerful, speedy, and accurate. I ran it on my wife's humongous cache of photos from our wedding, and found photos that were exactly the same size. FDFF also shows a preview of image files it finds, and offers some helpful filters you can apply to make copying or deleting the newest or oldest copies, for instance, very simple. Gina's previously covered and explained a whole bunch of free duplicate file tools, including WinMerge and the aptly named Easy Duplicate Finder, which our own avid photographer Jason deems the best duplicate file tool he's used. Mac: Those handy with Python scripts could try The Dupinator, but there's also the cross-platform Duplicate Files Searcher. There's Tidy Up!, a robust disk cleanup tool that includes a duplicate finder, but you're going to have to pay $30 after a restricted trial period. 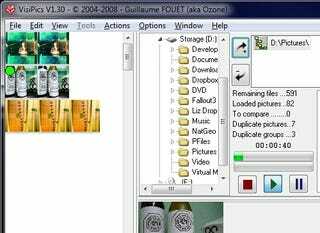 Duplicate photos: Duplicate files are a good first step, but your collection's probably cluttered with lots of almost-exactly-the-same takes, along with resized and cropped copies. To find images that look alike, we can turn to a few tools. We've previously recommended DupliFinder as a good tool for scanning folders for duplicates, and it is. It is, however, almost a little too thorough, matching up photos that have anything resembling similar pixel features. You can ignore those loose connections and sort your matches by percentage, but for a bit more control over how the search goes down, I recommend VisiPics (pictured above). 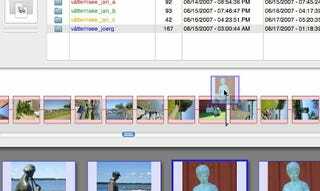 It scans the actual photo content of each image file, and so can take some time to tally up its findings if you've got a huge, huge database, but you can fairly easily let it run in the background and do your normal browsing and work. Matches are shown together, a sliding scale of matching looseness is offered, and while it's a shareware app with some locked features, it offers enough as a freeware app to do some serious cleaning. How do you get started with VisiPics? Choose your photo folder from the list in the top-middle row, hit the right-facing arrow with the "+" sign to add it to VisiPics' queue, then hit the Play-style button in the middle to start scanning for duplicates. Note: If you've previously used Picasa, iPhoto, or other photo management suites to organize and edit your photos, you may find lots and lots of photo duplicates. That's because those applications create folders of "Originals" to allow you to undo changes you make to photos, along with caches of thumbnail images for fast browsing. If you're not using these apps anymore, and you're sure you won't want to undo those changes, go ahead and remove those folders and duplicates. Otherwise, keep them, and remove their folders from your searches. Speaking of Picasa, Google's photo manager has a "Show Duplicate Photos" option in its Experimental menu, but that's exactly what it is—very experimental, and not all that clear about what you're deleting. You're better off going with an app that makes its findings clear. 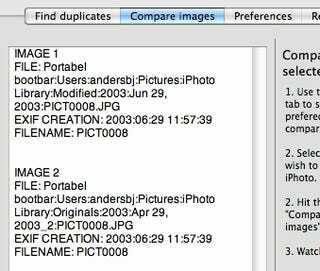 Mac: Duplicate Annihilator is a shareware plug-in for iPhoto (and Aperture 3, if you roll that way) that scans your iPhoto database and, well, finds duplicates. It's well-liked, and offers a trial run for free. Whether it's photo software that controlled your camera importing, or just years of inattention, there's a good chance your photo folder is stuffed full of folders that use all kinds of naming schemes, or no schemes at all. In my case, Ubuntu's photo manager, F-Spot, decided to give me a numerical Year->Month->Day branching folder system. Not being a professional photographer who has to make up receipts and masters discs for clients I shot on certain days, this makes almost no sense for my casual viewing of Piseco Vacation 2008 or Ultimate BBQ Roadtrip. On Windows, Mac, and even Linux (with a work-around), it's Picasa to the rescue. We've previously detailed an organization session with Picasa, but here's a shorter version of the highlights, using a much newer version of Google's photo organizer. Head to the Tools menu, select the Folder Manager, then find the folder that contains the bulk of your digital photographs. Click the button on the right to set Picasa to "Scan Always" this folder, at least while we're fixing it up. Hit OK at the bottom, then grab a soda while Picasa works its way through your photo folders. When it's all done, you'll see a list of your folders in the left-hand panel. It might be an ugly sight, and, if you haven't run the timestamp fix described above, Picasa's guesses as to when the photos were taken might be completely off. Whatever the case is with your folders, you're going to give your photos new homes now. Hit the View menu up top, scroll down to Folder View, and try out a few different sorting methods. Think about how you want to organize your photos. If you plan to keep using Picasa, iPhoto, or another organizing software, you won't need to manually organize photos by date, but by event. Better still, both Picasa and iPhoto have facial recognition features, and tagging/favorite systems, so creating a folder of your favorite shots of certain people isn't really necessary, either. Organize your photos into folders that make sense to humans ("Coastal Drive Weekend") for better search-ability and easy browsing. 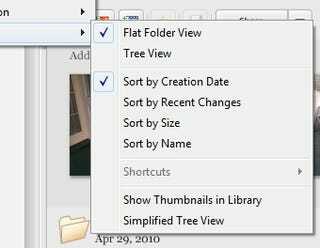 Click on a folder in the left-hand panel to jump to its thumbnails in the main panel. If there are certain photos in that group that belong elsewhere, select them individually (holding Control to select multiple items), then hit the green "pin" button in the lower-left box (or press Ctrl+H on your keyboard) to add it to your working group. Want to move an entire album? Select it in the left-hand panel, or click its folder name in the main panel, then "pin" it without selecting individual photos. Once you've pinned a group of photos that belong together, you can select them all from your tray of pinned items and drag them onto a folder to copy them there, then delete the folders they came from. Need a new folder? Hit the File menu with your pinned items selected, and choose "Move to New Folder." Picasa has a tendency toward helping you create new "Albums," which are groups of photos linked together virtually by Picasa, but not in the same place on your hard drive. That's the kind of loose organization that got you here in the first place. 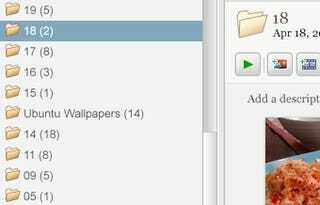 Be sure when you're moving things around in Picasa, you're actually moving between folders, not albums. It will take some time, but by scanning through Picasa's thumbnail images, and pinning and moving your photos around, you'll have a collection that makes sense to both the human eye and photo organizing apps. Once again, read our previous Picasa guide for an in-depth look at Picasa's organizing features.